The UBC Farm Practicum in Sustainable Agriculture is a four to six-month experiential learning program designed for aspiring farmers, environmental educators, gardeners, and students interested in applying knowledge about sustainable agriculture and food systems. Students bring a diversity of backgrounds and life experience to the practicum. Our program graduates share a vision of livelihoods and lifestyles grounded in sustainable and community-based food systems. The program is open to all; you do not have to be a UBC student (see details below for minimum qualifications). The application for the 2020 Practicum Program will be open in September of 2019. Since completing the Practicum, Robert and Stacey spent a couple years pursuing other educational opportunities before beginning their dream family farm in earnest. 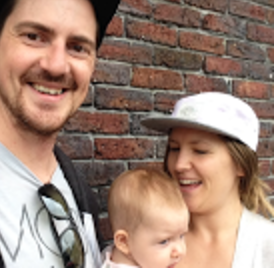 Stacey attended KPU in a Sustainable Agriculture program and Robert at BCIT and Groundswell. This summer, they couldn't wait any longer and started 'UpBeet Farm': a small-scale, organic and beyond, vegetable farm located at Stump Lake, BC. Dave established Lentelus Farms about half way through UBC Farm’s Practicum in Sustainable Agriculture. The Practicum helped him build many strong connections including with Professor Emeritus and mentor Dr. Art Bomke. Dave now rents three farms in the Comox Valley. He grow grains on one farm to feed his heritage pastured hogs. He also grows certified organic garlic on another farm and this year, he leased a 3rd farm for his lambs and hogs. 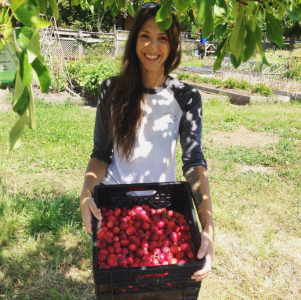 After completing the practicum in 2013, Katie went on to do a year of mixed-vegetable CSA farming at Farmers on 57th, as well as an orchard internship at UBC Farm. Katie has since moved to Pender Island, where she started Twin Island Cider, a farm-based cidery, with a fellow farm worker she met during her time at the UBC Farm. 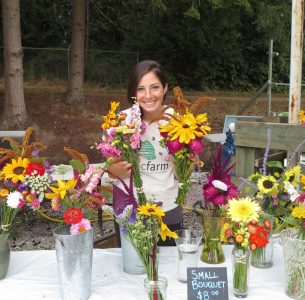 Samantha became a member of the UBC Farm family in the 2013 growing season. She transitioned straight from the UBC Farm Practicum to a Master's degree program in the Faculty of Land and Food Systems, where she studied agricultural policy and food sovereignty in the BC dairy industry. Samantha graduated in the Spring of 2016 and by the end of summer, she had secured a job as Community Animator for Farm to School's Vancouver Area Regional Hub. 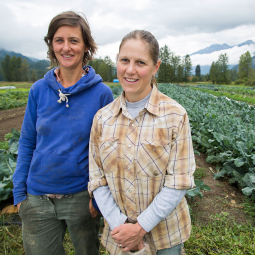 Simone and Sarah met during their practicum at the UBC Farm in 2008, and are now co-owners of Rootdown Organic Farm, a mixed vegetable farm serving restaurants, grocery stores and CSA members in the Pemberton and Whistler area. Since 2010, the farm has developed into a multiple-acre project, serving 20 restaurants and grocery stores, and over 70 CSA members, as well as raising Heritage pigs. The UBC Farm encompasses 24 hectares of integrated farm and forest lands on UBC’s South Campus. The farm is managed by the Centre for Sustainable Food Systems, which offers a wide range of interdisciplinary learning, research, and community programs on the site. Together, these programs explore and exemplify new paradigms for sustainable communities. Situated within a 90-year old coastal hemlock forest, the UBC Farm comprises a mosaic of cultivated annual crop fields, perennial hedgerows and orchards, and successional forest stands. The farm is home to a range of research projects and university courses. Community involvement is integrated throughout its Children’s Learning Garden, Indigenous programming, farm markets, community workshops, and a robust volunteer program. The Practicum program is hosted at the UBC Farm, a living laboratory of the Faculty of Land and Food Systems. The UBC Farm is the site of the majority of farming activities, guest speaker presentations, and classroom sessions. In addition, Practicum students visit a number of local farm operations to provide a regionally grounded food system context, and to make personal connections with experienced food growers. Prospective students are encouraged to visit the farm prior to applying to the Practicum. This gives applicants a better understanding of the hands-on nature of the program, along with a better sense of the UBC Farm community. Interested participants are invited to register for a volunteer session or workshop, attend a Saturday Farmer's Market, or otherwise participate in the vibrant learning community we foster. Every year a Practicum Open House is hosted at the beginning of the fall season before the application deadline. In 2018, our Open House at the UBC Farm occurred on September 16th, 12 pm – 2 pm; and we provided a forum to ask questions, meet current practicum students, and receive a tour of the site. To stay informed of our latest updates regarding UBC Farm Programming (including the Practicum Program), please sign up for our weekly newsletter. If you missed last year's Open House, note that we offer free public tours of the Farm every Saturday of our regular weekly Farmer's Market (early June to late October). No registration is needed. Meet at the information booth at our Farmer's Market. The 2019 Open House will occur in September. The exact date and time will be posted here in mid-late August. The Early Admission pool offers highly competitive applicants an opportunity for a quicker decision to be made on their status. Every application received on or before October 2nd will be automatically considered for Early Admission. All early applicants not receiving Early Admission offers of admission will be added to the Regular pool of applicants. All applications for the Regular Deadline pool are due by November 5th. All applications received after midnight November 5th (Pacific Standard Time) will be considered “Late” and may or may not be considered. A subset of the Regular Deadline pool is the “Summer Option”. We reserve very limited spaces for this option, so we encourage you to only apply for this option if your schedule truly prohibits you from attending the full program. The dates of enrollment for the “Summer Option” are April 12th to August 24th. Students completing the “Summer Option” are eligible (additional action is required) to receive academic credit (6 credits via APBI 365). What qualifications do I need before I apply? Ability to stay and study in Canada for the entire duration of the program. Although no prior experience in farming or gardening is necessary, it is looked upon favorably. Successful applicants are usually strongly committed to exploring food production or food sustainability education as a central part of their future. To be clear, you do not need to be UBC student, or a student at all. We welcome international applicants. It is common for students in the practicum cohort to be between the ages of 20-45, though we certainly welcome (and have had several) older students as well. How many applicants do you accept, and how can I increase my chances of acceptance? Acceptance rates vary from year to year. Over the past several years, it has ranged from roughly 20% to 40%, and we've accepted a total of 12-14 students. We look at a wide range of factors when selecting the incoming cohort. Applicants that have already demonstrated at least some prior commitment to developing skills and knowledge related to sustainable food and farming/gardening usually have a higher chance of acceptance; however, we also sometimes make offers to applicants with very little to no experience. Although many successful applicants don't necessarily have a clear vision for their path beyond the Practicum program, this can also be a helpful asset. Can I receive academic credits? UBC students completing the full program are eligible to receive up to 9 academic credits (6 credits via APBI 365 and 3 credits via APBI 465). “Summer Option” students are eligible to receive 6 academic credits (via APBI 365). Further action is required to obtain credits. If interested, please let us know in your application. Note: APBI 260 or APBI 265 is a prerequisite for enrolling in APBI 365; and APBI 365 is a prerequisite for enrolling in APBI 465. Do I need to be a current UBC student? No. In fact, recently, the majority of our practicum students have not been UBC students. Moreover, although the UBC Farm hosts the majority of activities for the practicum program, acceptance to the UBC Farm Practicum in Sustainable Agriculture does not imply acceptance or enrollment in UBC. Practicum students do not pay UBC student fees, receive a student card, or UBC benefits. Enrolled UBC students are certainly welcomed and encouraged to participate in the Practicum program provided the program schedule works with their academic commitments. To make the practicum program even more accessible to students, we offer a "Summer Option" (April 12-August 24). Program fees for 2019 are $4,325 (Full Program); and $3060 (Summer Option). Accepted students must pay an initial $425 deposit and the remainder of the fee in February 2019. We are very appreciative that through the generous support of Choices Market, we have, in recent years, been able to provide approximately $100 for seed purchases for each practicum student. Moreover, Choices Market has offered one practicum student an opportunity for part-time employment. Although these two features have not yet been confirmed for 2019, we are hopeful that this arrangement with Choices Market will continue. Can I work while participating in the practicum? Yes. 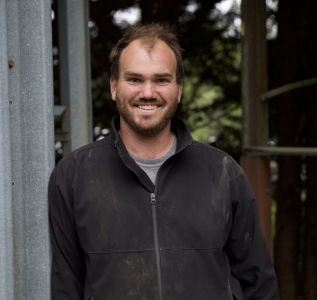 Because of the high-cost of living in the Vancouver area, most UBC Farm Practicum students do hold part-time jobs or pursue seasonal employment while participating in the program. We have structured the program schedule to accommodate this reality. That said, to get the most out of the program, many students plan for limited work hours during the busiest and most physically demanding May-September portion of the schedule. What is the time commitment for the practicum? To successfully complete the Practicum, we require 90% attendance of scheduled program hours. We have found that students benefit the most when they plan for an average of 5-7 hours/week in additional off-program time to establish, care for, and maintain their individual and shared plot spaces, and to complete assignments. Yes! We certainly welcome applications from international applicants, but unfortunately we do not have the staff availability or resources to provide information or support regarding immigration, visa requirements, or housing. If you live outside Canada and have family here who can provide support, or if you are already a currently enrolled UBC international student with up-to-date visa credentials, you will find the process less complicated. Is housing provided at the UBC Farm? No. At this time, we do not have any possibility of on-farm housing. If you are considering this program and are not from the Vancouver area, we recommend checking online rental boards and shared housing options. See http://vancouver.housing.ubc.ca/other-housing/off-campus-housing/ for resources. Do I receive a degree? Although the Practicum is not a degree program, students who complete all program requirements will receive a Certificate. In addition to the knowledge and skills obtained through the program, students often indicate that the program presented a valuable opportunity to integrate into the Vancouver and regional farming community. What could I do with this Certificate? Alumni start their own farming operations, obtain jobs on farms, pursue advanced degrees related to agriculture and food systems, work in an educational capacity on farms and gardens, or work off-farm jobs related to creating a sustainable and socially just food system. Others pursue homesteading projects or other career paths. Long after they've graduated, we continue to support our alumni by sharing job and land access opportunities with them. View the above slide for specific examples of the paths of a few of our alumni. How can I (or my organization) support the future growth of the Practicum program? If our webpage and the program overview did not fully answer your questions, please send an email to the Practicum Coordinator, Seth Friedman at ubcfarm.practicum@ubc.ca. In addition, here is a short video that features a practicum alum. The Practicum would like to gratefully acknowledge the support of the following: West Coast Seeds, Choices Market, Young Agrarians, Vancouver Urban Farming Society, Groundswell, Vancity, Dr. Art Bomke, and Anonymous.